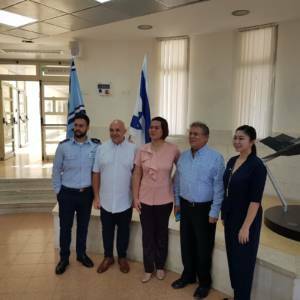 A Filipino delegation led by Davao City Mayor, Ms. Sara Duterte, visited the Sci-Tech Aviation and Space High School in Ma’ale Adumim. 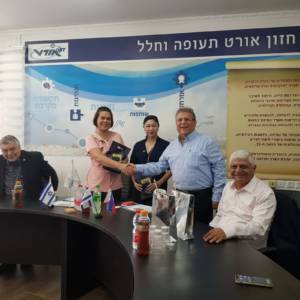 The visit was facilitated by Dr. Effie Ben Matityau, the Israeli ambassador to the Philippines, and Mr. Shmuel Weiss, Chairperson of the philanthropic foundation Pass It Forward. Sara Duterte (Zimmerman), Mayor of Davao City in the Island of Mindanao, Philippines, is the daughter of the Philippine President Rodrigo Duterte, and is considered a rising star in the local political scene. She came for her first-ever visit in Israel as part of the president’s entourage, on his recent visit in Israel. 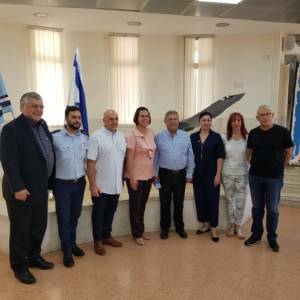 On the exceptional occasion of Ms. Duterte’s visit in Sci-Tech Aviation and Space High School, Ma’ale Adumim, she was accompanied by the Mayor of Ma’ale Adumim, Mr. Benny Kashriel; Israel Sci-Tech Network’s Director-General, Mr. Zvi Peleg; and the Chairperson of the Pass It Forward Foundation, Mr. Shmuel Weiss. Ms. Duterte was greeted by the school’s students, who proceeded to present to the visitors a range of their unique projects in the fields of robotics, space, and aviation, as well as the school’s advanced labs, and some star-gazing through the school’s highly complex telescope. 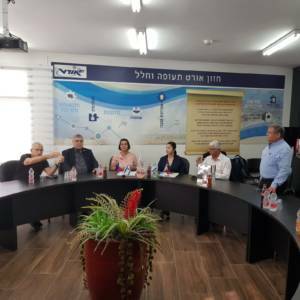 This visit paves the ground toward implementation of innovative study programmes, developed by the Israel Sci-Tech Network, in the city of Davao, Philippines. In the framework of the Lighthouse Project, The Israel Sci-Tech Network provides the Philippine educational system with knowledge, such as training and study programmes, including the professional training of teachers in an innovative, entrepreneurship-oriented pedagogy for STEM-related subjects, turning the teachers into “entrepreneur-teachers”. This cooperation follows a memorandum of understanding signed last year between The Israel Sci-Tech Network, the City of Davao, and the Pass It Forward Foundation, overseen by the Israeli Embassy in the Philippines, towards implementation in the Philippines of the iSTEAM Programme, as well as several other programmes. These innovative study programmes, created by the Sci-Tech Network’s R&D Center, are currently implemented in the network’s 237 schools and colleges, and draw a lot of interest worldwide.